Our latest 3D model is the Part Ninja electronic component testing tool. 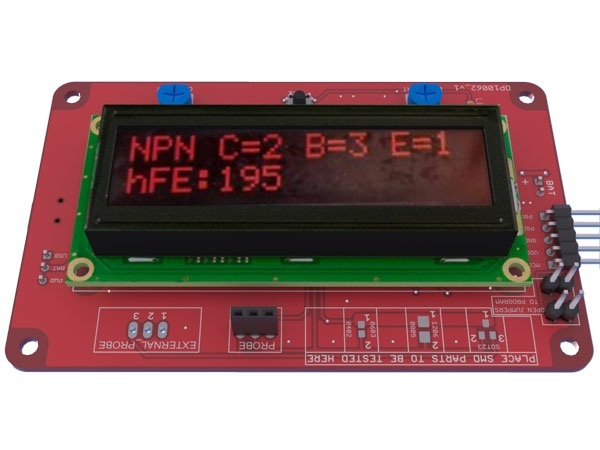 It identifies electronic components like transistors and FETs, determines the pinout, and measures basic specifications. Several SMD footprints are included so surface mount parts can be tested too. Check out our tutorial on how to build 3D models from Cadsoft Eagle board files, as well as the tutorial on how to render life like images with Maxwell for Google SketchUp. Later this week we will feature a tutorial on how to use the open source Kerkythea to render your images. We used open source Kerkythea rendering system to generate the rendered image above. This entry was posted on Monday, April 2nd, 2012 at 3:00 pm	and is filed under 3D Model, Part Ninja. You can follow any responses to this entry through the RSS 2.0 feed. You can skip to the end and leave a response. Pinging is currently not allowed. Is this the display overlay put on the 3d model from the forum post? Is the PCB currently available for the Part Ninja? hey,could you do a tut on the open source Kerkythea rendering system ? ?